Part two of our Christmas Week box office coverage sees us examine the Christmas Day releases. This year, four films have chose to forgo a weekend release for their wide release, and instead have aimed for those post-presents family crowds, which are numerous enough to make Christmas Day one of the most lucrative days of the year at the box office. Aliens vs. Predator: Requiem may not seem like the most holiday-appropriate fare, but it does still come from one of the most successful action franchises in movie history, and it can probably open just about whenever it wants. Following up on the $80 million earning Alien vs. 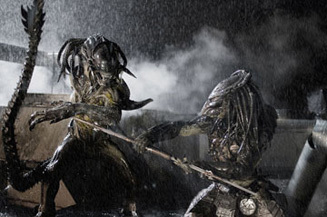 Predator, this sequel moves the action from Antarctica to small-town North America, putting humans directly in the crossfire of a war between the seemingly unstoppable Aliens and the ultimate hunters, the Predators. AvP:R (as all the cool kids will be calling it) is opting for gore to bring people in – it's a hard-R rated film and its red-banded trailer was one of the bloodiest things I've ever seen outside of an Evil Dead film. This is both a good thing and a bad thing, as it's self-limiting, but will probably attract a good number of action hounds. That's about all it has going for it, as the star power is, if anything, even less than the star-free Alien vs. Predator. But, with the combination of two classic franchises, this could behave similarly to the Resident Evil films, which have a dedicated group of first weekend fans, but disappear from the box office quickly. Over the three days prior to the weekend, expect a take of about $16 million. Family audiences get yet another choice for holiday week viewing, with the launch of 9" target="new">The Water Horse: Legend of the Deep. Essentially a retelling of the Loch Ness Monster Legend, it stars Alex Etal (who you may or may not remember as the wide-eyed rapscallion from Millions) as a boy in WWII Scotland that finds a mysterious egg-like thing. When it hatches to produce something that looks like a cross between a hippo, a horse and a giraffe, well, then he has the best friend a boy could ever have! If only he didn't have to keep it completely secret, and if only it wasn't doubling its size every week. The Water Horse belongs to that vague "secret friend" genre of kids films that includes such movies as E.T. and The Iron Giant, and are often some of the most thematically successful children's movies, if not always the most financially so. The Water Horse should fall in between these two a little, as it's received some relatively heavy promotion, and the ads hit a lot of triggers for pre-teen moviegoers (i.e. bathroom humor, demonstrative animals). I see this one being a mild hit over the next few days, with about $14 million from the 25th to the 27th.